If you're a regular reader of my blog, you've probably heard me say (multiple times) that I need a break from World War II books. They are often very good but usually emotionally wrenching - important to read but perhaps not as a steady book diet. So, I surprised myself by agreeing to review a new YA novel set during WWII, The Pirates of Cologne by Dinah Mack. I was even more surprised by how how powerful and compelling this story-based-in-fact was. I'm glad to have read it. Thirteen-year old Sebastian is living in Cologne, Germany, in 1942. He managed to escape from a Hitler Youth Camp, and is now taking care of his grandmother while his father, who was a leader of the local Communist party, is in a Nazi prison camp. Sebastian loves to read (though books are scarce now) and write, but he is lonely until he meets Hans, another teen boy. Hans dropped out of school in order to support his mother, while his nineteen-year old brother is at the front. 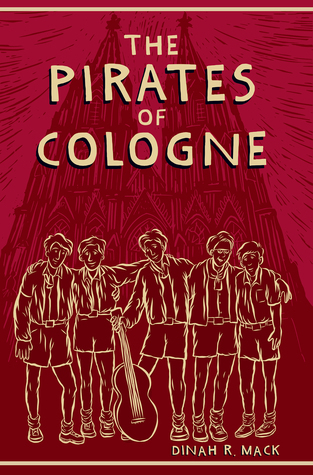 Hans introduces Sebastian to the other Pirates of Cologne, a small group of local boys who associate themselves with the Edelweiss Pirates, who aim to resist Hitler and Nazi propaganda. Sebastian gets involved with the Pirates, first participating in small shows of resistance, like stealing food from Nazi officer homes. Soon, though, the boys have a chance to join the larger resistance movement, and have a greater impact...though they are also exposed to far more danger. The Pirates of Cologne is a gripping, moving story that pulled me in right from the first pages. The novel is action-packed and filled with suspense, but it also has a lot of heart, as you come to care for these brave boys who choose to put their lives at risk for what is right. It is inspiring, but it is set in WWII, so it is not all happy endings for all of the boys. As much as I resisted reading yet another WWII story, there are still important stories to be told, and this novel introduced me to a different aspect of that period of history that I had been unaware of. The Edelweiss Pirates were real, though these characters are fictional, and the courage and dedication of these young people was awe-inspiring and is important for today's youth to learn about. Disclosure: I received this book from the author in return for an honest review. My review is my own opinion and is not influenced by my relationship with the publisher or author. I'm also trying not to read too many WWII novels...but just added this to my TBR! ha ha - sounds familiar! This one is worth it! It's amazing that there are still WWII/Holocaust stories that we haven't read! The stories of resistance are so inspiring! I know!! The author has also started a website for teachers to help teach kids about activism and making a difference, with additional book recommendations!